Ramsey manufactures silent chains to accommodate a wide variety of application requirements and budgets. Links at the bottom of this page lead to detailed information on specific products. In power transmission applications, silent chain drives are capable of transmitting power with low noise, high efficiency, and reduced vibration. 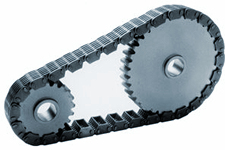 Speeds and loads often exceed the capability of other belts and chains. Almost all Ramsey power transmission chains utilize efficient, quiet, two-pin roller bearing joints; technology which has been shown to outperform conventional, round pin joints. These chains can be found in a wide variety of demanding industrial and automotive applications. In conveying applications, silent conveying chains provide a heat resistant, flat, durable, non-slip, conveying surface which can be customized to fit a wide range of industrial applications. Chains are designed to smoothly engage sprockets with minimal variation in the conveying surface speed. 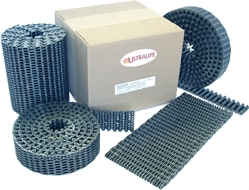 Many options are available in both traditional conveying chains as well as unique, wear protected chains. Ramsey also offers custom, made to order chains and sprockets, as well as replacements for silent chain from other manufacturers.